Gov. 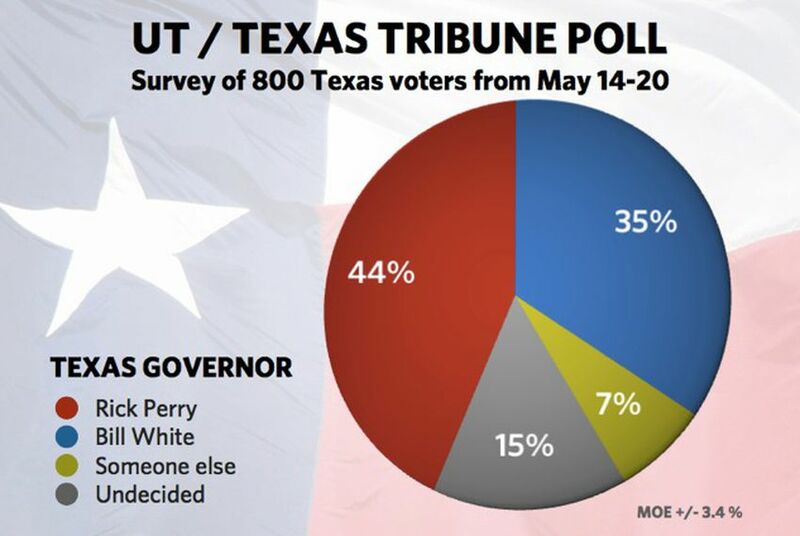 Rick Perry leads his Democratic challenger, former Houston Mayor Bill White, 44 percent to 35 percent in the latest University of Texas/Texas Tribune poll, which was conducted May 14 to 20. Fifteen percent of the 800 registered voters surveyed are undecided about which of the gubernatorial candidates to support, while 7 percent prefer "someone else." Perry leads among men, women and Anglos. White leads among African-Americans and Hispanics. In five other statewide races polled, each Republican leads his Democratic opponent by a double-digit margin. Republican Rick Perry leads Democrat Bill White by 9 percentage points — 44 percent to 35 percent — in the 2010 race for governor, according to the latest University of Texas/Texas Tribune poll. Those numbers are identical to the results of a "fantasy race" between White and Perry in the February UT/Tribune poll, which was taken before Democratic and Republican primary voters selected the two men as their nominees. This time, 15 percent said they don't know yet whom they'll vote for, and 7 percent said they'd prefer "someone else." That last finding could be consequential: Libertarians will choose their candidate for governor at a state convention next month, and that candidate or a write-in or some combination of the two could give those "someone else" voters a place to go. Perry's stronger with Anglo voters, leading White 55 percent to 25 percent. White is stronger with African-American voters (69 to 5) and with Hispanics (43 to 32). Perry is ahead among both men (48 to 34) and women (40 to 35). • Lt. Gov. David Dewhurst leads labor leader Linda Chavez-Thompson 44 percent to 30 percent, with undecideds at 20 percent and “someone else” at 6 percent. • Attorney General Greg Abbott leads attorney Barbara Radnofsky 47 percent to 28 percent, with undecideds at 20 percent and “someone else” at 6 percent. "It's hard not to look at this and feel like the Republican recovery from the 2008 national surge is complete, and then some, in Texas," said pollster Jim Henson, who heads the Texas Politics Project and teaches government at UT. The incumbent governor has about the same number of supporters and detractors when it comes to his job performance: 42 percent approve of his work, 39 percent disapprove and 16 percent are neutral, saying they neither approve nor disapprove. Those who feel strongly one way or the other about Perry were more likely to disapprove (23 percent) than approve (13 percent). Texans are clearer when it comes to Barack Obama: 35 percent say they approve of the president’s job performance, while 58 percent disapprove. And they're not wishy-washy about it. Only 19 percent strongly approve of Obama's performance, while 50 percent strongly disapprove. "You take all of this together and you're seeing the solidification of anti-Washington sentiment trumping anti-incumbency," Henson says. "You've already seen the Perry campaign trying to identify White with this — they're obviously looking at the same thing." The numbers in the races polled aren't far from the generic party numbers in the poll. Asked which party’s candidate they'd support in their local races for Congress, 46 percent chose the Republican and 34 percent chose the Democrat; 15 percent were undecided and 5 percent chose "someone else." Asked the same question about party preferences in state legislative races, voters gave a similar answer: 44 percent Republican, 33 percent Democrat, 18 percent undecided and 5 percent "someone else." "Anecdotally, off the top of your head, if a Democrat runs against a Republican in the state of Texas, what’s the spread? Twelve points," says pollster Daron Shaw, a professor of government at UT. "This looks pretty much like a statewide election in Texas looks. It doesn't look like some huge Republican tide, but it doesn't look like a Democratic renaissance, either." The pollsters reprised a question from our February poll, asking voters how they’d vote in a congressional election if the Tea Party was organized and fielded a candidate. The Tea Party votes appear to come out of the Republican total, with 33 percent saying they'd back the Democrat, 23 percent preferring the Tea Party, 19 percent supporting the Republican, 26 percent choosing "don't know." The February poll result was similar in that the Tea Party vote seemed to come wholly from the GOP, but with one difference: There were more Republican votes than Tea Party votes in February, and now the Republicans are behind. That — and the 6 or 7 percent of voters who chose "someone else" in specific head-to-head matchups — puts an asterisk of sorts on what otherwise looks like a Republican advantage. Voters might not be happy with the party in power, but they're not exactly rushing into the GOP’s embrace. "It looks like a generic spread," Shaw says, but he adds that "votes that would normally accrue to the 'out' party are very sensitive to other options." 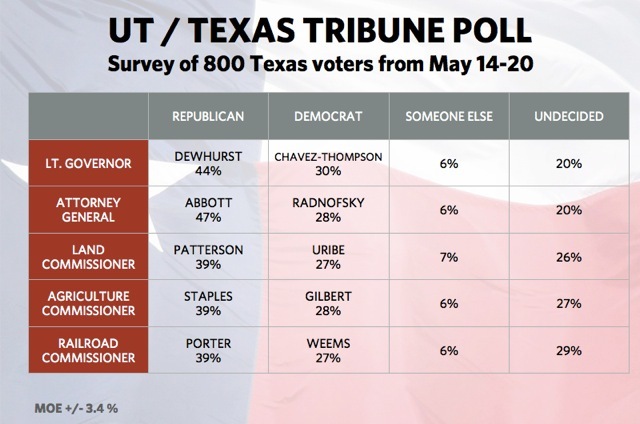 This is the third University of Texas/Texas Tribune poll (the first two are here and here). The Internet survey of 800 registered voters was conducted May 14-20 and has a margin of error of +/- 3.46 percent.